Halloween is an exciting time for many people, old and young! The spooky movies, haunted houses, pumpkin carving, and trick-or-treating gets everyone excited for this holiday, except for maybe dentists. The candy you and your kiddos will be eating can be bad for your teeth, which makes it important to take extra care during this time of year. We don’t expect parents to sift through all of their children’s candy to pick out the pieces they can and cannot eat, or to tell them why each type of candy can ruin their teeth. This is not the way to go about your teeth and Halloween, and is a great way to get your children to dislike you. Just take Willy Wonka’s father for example. At Brookside Dental Care in Cheyenne, we know that your kiddos (and yourself) will be enjoying a few more sweet treats than usual towards the end of the month and into the next, and we know the damage it can do to your teeth. However, we are not here to tell you to stop eating candy and throw it all into the fire! We are here to help ensure that you take care of your teeth as well as possible during this time. While avoiding candy altogether would be the best thing for your teeth, we understand the temptation. In this blog, we are going to give you tips to help protect your teeth while enjoying those sugary treats! Read on and make sure you and your kiddos follow these tips. You can also schedule a dental cleaning after Halloween to ensure you get a deep clean after the sugar overload! If you have young children, try to limit the amount of candy they have each day. You should also limit your own consumption. Try to keep it to one or two pieces a day. The fewer the better. It could be easy to pack one in your own and your kiddo’s lunch, as well as allow one for dessert. But we won’t judge you from sneaking a piece or two. If you have to, keep your kiddo’s candy in a safe place so that they don’t always have easy access to their favorite pieces. Your older kids will likely try to avoid this rule, but it will help keep their teeth healthy, so we suggest you use it. It is best to eat your piece of candy after a meal. This is not because you might fill up on candy and not eat your full dinner, rather, it is due to the fact that your saliva production increases during meals. This will help rinse away any food and candy particles left in your mouth and allow you to avoid bacteria creating acid that can harm your teeth. So, if you give your children candy for their lunch and after dinner, make sure it is soon after they eat their meal. It will help stop sugars from causing more harm. While we know it can be hard to take candy away from your children (mentally not physically), try to keep them from eating sticky candies. These include caramels, gummy bears, taffy, and other sticky candy types. These get stuck on the teeth easily and will remain there for a while. Saliva even has a hard time washing these candy types away. This can lead to tooth decay, which nobody wants. If you can, remove the sticky candies from the kiddo’s candy collection and get rid of them! If not, just make sure your children are cleaning their teeth very well. While the sugar overload that comes with Halloween is underway, it is important that you make sure you and your kiddos are still taking good care of your teeth. 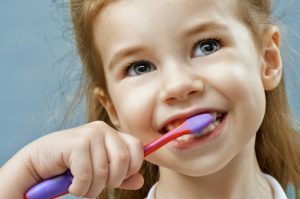 Brush twice a day (or more) and make sure your kids are brushing thoroughly. We all know how kids can be when it comes to brushing their teeth. You will also want to floss twice a day. Work hard to remove any candy particles left behind, this will help ensure that your smiles stay beautiful! 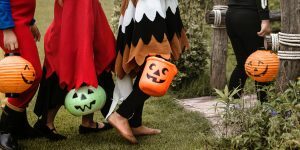 These are a few tips that will help your teeth survive through Halloween. Make sure you schedule a cleaning for you and your kiddos after all the candy is gone! This will help get your teeth back in the best condition. Contact Brookside Dental Care in Cheyenne to learn more now!